Having seen the struggles of the other European side tipped as dark horses, Switzerland, in their opening game, Belgium had good reason to be wary, especially when their team hasn’t been as successful as their strong selection of talent suggests it should be. Marc Wilmots sent out his team in a 4-2-3-1 with Moussa Dembele playing slightly ahead of Alex Witsel in the double pivot, while Algeria went out in a 4-3-3 led by Al Arabi Soudani rather than Islam Slimani up front. 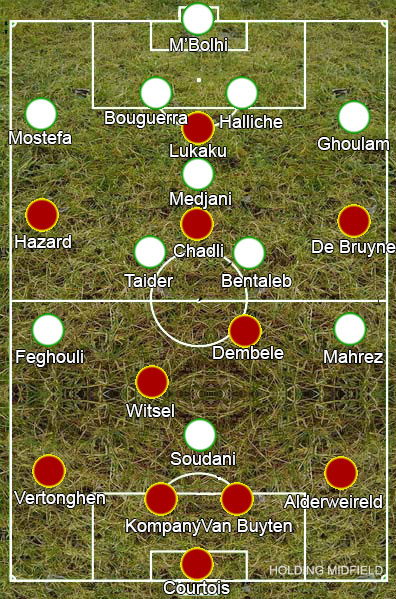 Primarily defensive, Algeria impressed with their organisation early on, particularly in dealing with Eden Hazard – doubling up and pinning him into a corner whenever he received the ballÂ – yet their job was made easy by Belgium. For all their talent, they have brought only one natural full-back – Anthony Vanden Borre, who is now back at Anderlecht in his homeland – to the World Cup, instead opting for centre-backs Jan Vertonghen and Toby Alderweireld on the left and right respectively. While both are good technically for centre-backs, they lack the attacking thrust needed as full-backs against a defensive team like Algeria. Belgium really needed someone to get forward and stretch the massed ranks of the Algerian defence but neither Vertonghen or Alderweireld was the man to do it, staying back with their centre-backs. The more attack-minded Thomas Vermaelen may have been a better option on the left side, albeit less defensively secure, but even he would still be a square peg playing in a round hole. Algeria sat extremely deep with even Soudani coming back to pick up Witsel, ensuring Belgium couldn’t play through them and managed to steal the lead via a penalty. They won it by taking advantage of another aspect of the full-backs’ play – they stick close to opposition players. Alderweireld was caught too high as Faouzi Ghoulam raced beyond him to cross and Sofiane Feghouli was brought down in the box having got ahead of Vertonghen. With the lead, Alergia were even more defensive, surrendering the ball with punts upfield and dropping extremely deep. Midfielders would often follow players into their backline, which would open up some space for the Belgians to take shots from distance, but it wasn’t a great method of equalising and Rais M’Bolhi dealt comfortably with everything that came his way. Dries Mertens was introduced in place of Nacer Chadli, offering more flexible and exciting attacking play, while the substitution of the disappointing Romelu Lukaku for Divock Origi didn’t make much difference initially – not offering much more of an aerial threat than the Everton striker and the Algerian backline was too deep to make use of his pace. It was the introduction of the much-maligned Marouane Fellaini that got Belgium back into the game however. Whatever you made of his midfield displays for Manchester United last season, there is no denying that Fellaini is really big. Big enough so that any ball swung into the box goes from unimaginative playing of the percentages to a genuine threat and, with Algeria playing so deep, Fellaini was close enough to goal when he went up for a header to score. No longer having a lead to protect, Algeria ventured forward more, opening up space behind for Origi to use his pace effectively, and it wasn’t long before they took advantage of the Africans opening up with Mertens finishing a good counter-attack. Belgium will be satisfied with their result and Algeria with their performance, but neither will be truly happy with the game.